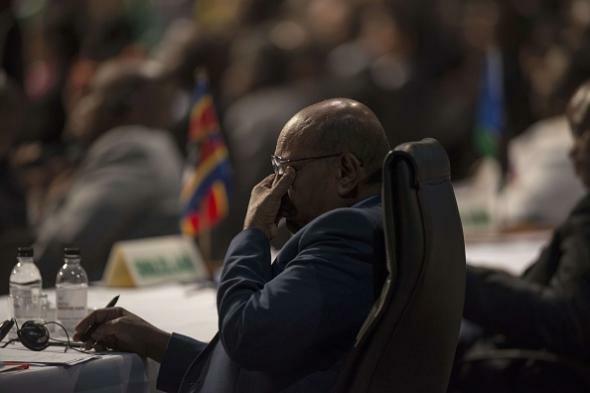 Al-Bashir, genocide arrest, South Africa: Sudanese leader leaves before order given. Sudan’s Omar al-Bashir at the African Union Summit in Johannesburg on June 14. His apparent departure came as a High Court resumed a hearing on the South African government’s legal responsibility toward Mr. Bashir. The hearing began on Monday afternoon, but Mr. Bashir’s departure would make the proceedings moot. The High Court ultimately decided to order al-Bashir’s arrest, reports indicate, but the decision likely comes too late to be enforced. Al-Bashir has controlled Sudan since 1989, and the ICC accuses him of directing the persecution and murder of civilian populations in Darfur. Before his apparent escape, the United Nations, the United States, and the European Union had called on South Africa to carry out the ICC’s warrant for al-Bashir’s arrest.